The Lulu Brushed Steel Stool Grey brings exclusive style to a neat and compact bar stool design. Tremendously efficient and practical, the Lulu delivers a touch of contemporary class and luxury to your bar area without compromising on much-needed space. With soft grey faux leather upholstery providing a modern touch, the rounded seat is padded with dense foam for superb comfort, and it also has a low lip backrest at the rear to offer reassurance. A single brushed steel column and round base form the sleek frame, which has many features. 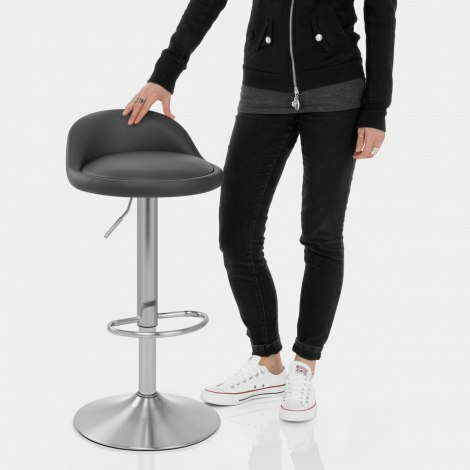 A gas lift feature means its height can be adjusted, while the stool's capacity to rotate 360-degrees adds to its usability. Lastly, the curved footrest and protective floor guard are wonderful additions. "Look absolutely fabulous around my new island"
Quick delivery, very happy with product. Comfortable and stylish. Great addition to kitchen island. Stylish and contemporary. Brushed chrome finish adds a chic look. Well made and solid. Arrived next day as promised and look great, especially the brushed steel. Really easy to put together as well. The seat area seems a little bigger than some others we'd seen which means they're really comfortable as far as a stool goes, and the little back rest helps with that too. Overall, really pleased. Very soft and comfortable. Chairs look good quality and fit well with our kitchen island. Really pleased, prompt delivery. Easy to put together and look absolutely fabulous around my new island in my new kitchen. Colour and quality very good, surprisingly good value for money too.